Is Cable in for more losses? The pair just bounced off the area of interest at the middle of its long-term range visible on the 4-hour forex time frame, putting it on track towards the bottom near the 1.5200 major psychological level. Stochastic is on the move down but is already in the oversold region, which suggests that selling pressure might weaken soon. However, the 100 SMA is still below the 200 SMA, indicating that the path of least resistance is to the downside and that a breakdown might even be possible. If that happens, GBP/USD could tumble by an additional 600 pips, which is approximately the same size as the range. 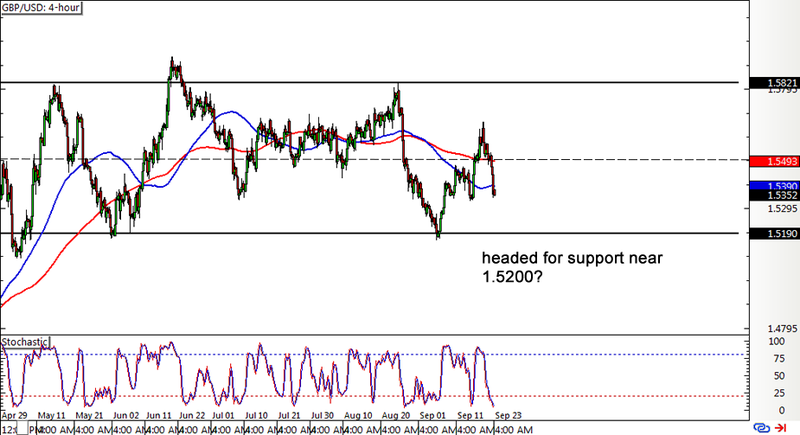 If support holds, a move back towards the top of the range just above the 1.5800 handle could be in the cards. Remember that EUR/GBP range I showed y’all yesterday? The one where price finally confirmed its southbound route? 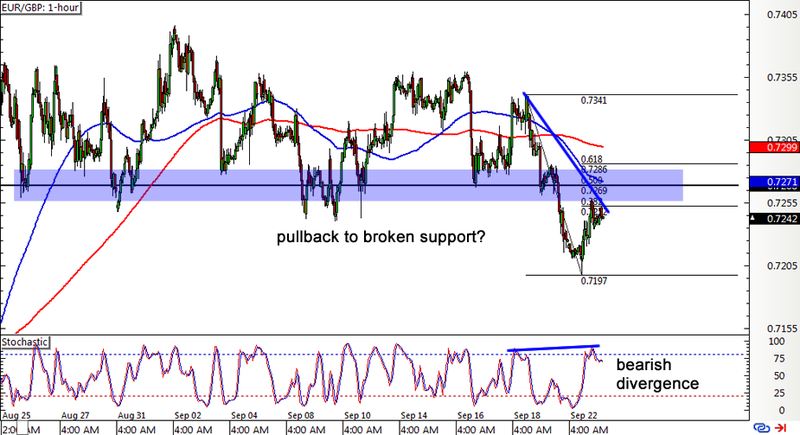 Zooming in to the 1-hour forex chart shows that the pair might still be able to pull up to the broken support area, which coincides with the 50% Fibonacci retracement level and the 100 SMA. If that ain’t enough to convince y’all that the area of interest is likely to hold as resistance, then you gotta see the bearish divergence forming as well, with EUR/GBP forming lower highs and stochastic showing higher highs. If the pair resumes its slide, it could head back to the previous lows at the .7200 handle or create new ones. Better make sure this setup meets the 9 Rules for Trading Divergences before hopping in! Still holding out for a breakout? 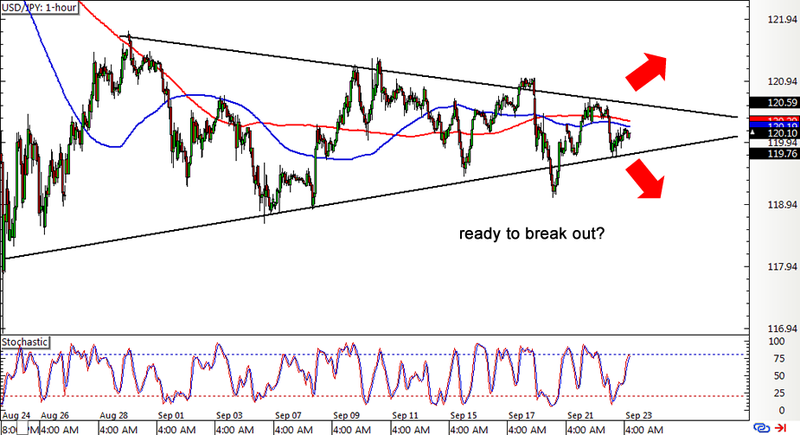 You should definitely keep close tabs on this USD/JPY symmetrical triangle forex chart pattern then! The pair has been stuck inside this consolidation pattern for an entire month so it might be time to head out. The question is: Which way will it go? The 100 SMA is currently below the 200 SMA, hinting that a downside break might be in order, possibly leading to a 400-pip selloff. Stochastic is on the move up, though, which means that buyers are still in control of price action for now. If dollar bulls are strong enough, they could push for an upside break past the triangle resistance at the 120.50 minor psychological level and spur a 400-pip rally. Just don’t forget to set your entry orders properly in order to avoid getting faked out either way.